One of the problems I have faced, being a gamer, is shelf space. 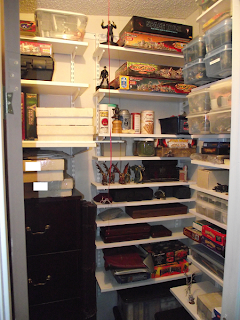 RPG books, Miniatures, terrain, collectible card boxes, board games, and accessories created from items that you dream up new uses for, all clutter your respectable living space. At one point I had four 3' x 6' bookshelves filled with just gaming books; the other stuff filled two closets. And look upon myself and curse my fate,"
Ironically, this happens to coincide with a recent post from a friend, called GenCon: Models, that mentions the multitude of terrain he witnessed at Gencon. In my draw down of gaming material, I given away almost all of my terrain, including a couple sets of Dwarven Forge to supplement a friends collection. The next portion of my gaming redesign was to redo my closet to be more 'gamer' friendly. I was able to accomplish this by installing an Elfa System form the container store. I haven't done this previously because the system is not cheap. My wife was able to find a pre-used system that had enough to do four closets at about 15% of the store price. This allowed me to create a multitude of short shelves to store things like minis or games without have to stack them too high. The Elfa System also has specialized pieces like drawers you can install, but nothing specifically for gaming. To finish, if you have a free wall and want to maximize space use, I highly recommend a shelving system that allows you to set shelves at various heights and introduce more shelves whenever you need them. If you know another shelving system, please feel free to comment.